Finally, I replaced my turntable. It's been over ten years since Katrina's flood waters more than took care of my wonderul A&R turntable. The model was over twenty years old and looked good enough to be a piece of furniture. Additionally, the turntable had a sentimental tug for me, and I just couldn't bring myself to replace it. 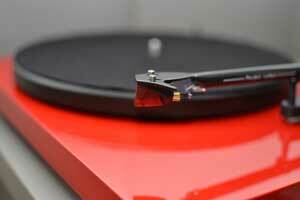 But recently, I broke down and went to an audio store to preview a turntable that had gotten some buzz. Henry at Alterman Audio in Metairie, LA was very helpful as he demonstrated the capabilities of the Austrian-made Pro-ject Debut Carbon. I ordered one and within a week my shiny red turntable was spinning some records that I hadn't listened to since my teenage years. 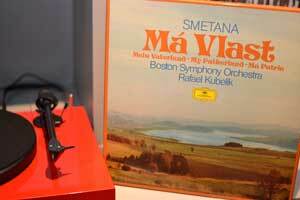 Simply because the color of the box set stood out, I picked up Smetana's MaVlast with the Boston Symphony, conducted by Raphael Kubelik, out of a record storage box that hadn't seen the light of day for decades. Listening to this 1971 recording made me once again appreciate the style of music-making that had more do with emotion, passion and the heart than with clinical perfection. It's worth a listen. And be prepared to feel the Moldau rushing by.